Up-on children under 10-years age, 25% discount apply. 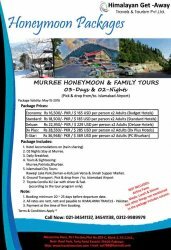 Overnight stays:02-Overnight stay at Murree Hills and surrounding areas. Note: Above does not includes peak season rates of Chirstmas, New Year, Winter & Summer Holiday Seasons. Ground Transport: Pick & drop from / to. Islamabad Airport / Rawalpindi Railway Station. Latest model Toyota Corolla XLi Car (with driver & fuel according to the tour program only). Hotel Accommodation on twin sharing. Above does not includes peak season rates of Chirstmas, New Year, Winter & Summer Holiday Seasons. Booking minimum 15 ~ 20 days before departure date. All rates are nett, nett and payable directly to HIMALAYAN TRAVELS - Pakistan. For Booking & Reservations. Click Link.